Ponzi is responsive magazine WordPress theme very suitable for blog and review. It’s a responsive website design theme. Ponzi WordPress Theme is made for clean ,minimalist magazine and modern design. This News WP theme support Boxed and full layout. Google fonts which are used Oswald and Open Sans. It’s based on bootstrap 3 (Grid system, Typography, Basic utilities, Responsive utilities). 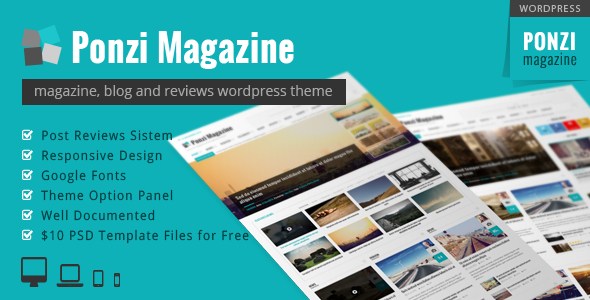 Item Reviewed: Ponzi Responsive WordPress Theme Magazine Review 9 out of 10 based on 10 ratings. 9 user reviews.